Why does any leader fail? 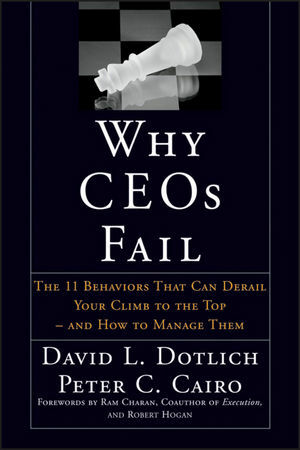 One could probably write many books on this, but research done by two top executive coaches and published in the book, Why CEOs Fail, identifies eleven different possible behavioral “derailers” that could sidetrack any of us. These are possible “traps” we could fall into – often because we use a “winning” behavior to an extreme. Arrogance: You think you are right, and everyone else is wrong. Confidence is good, but it can go too far. Melodrama: Always needing to be the center of attention. Volatility: I had a boss like this. His enthusiasm was great but I sometimes had to calm him down when he was about to make a bad rash decision. Excessive Caution: Analysis paralysis – too afraid to make decisions. Habitual Distrust: Always focusing on the negative or thinking the worst of others. Aloofness: Maybe you are really just shy or introverted, but you need to make an effort to connect with others. Mischievousness: You think that rules were made to be broken. Caution: Not ALL of them! Eccentricity: Trying to be different just for the sake of it. A little different is cool; but the mullet – no. Passive Resistance: So annoying. Just say yes or no or whatever else is on your mind. Perfectionism: You get the little things right and the big things wrong. The new logo is classy but the organization strategy is way off. Eagerness to Please: Being overly dutiful might win you a popularity contest, but leaders often need to take unpopular stands. If you see yourself in any of these – then beware! These “shadow sides” of our personalities can derail a leadership opportunity or even a career. I admit to seeing some of these behaviors show up in my life and have tried to learn to identify them and regroup. Check out the book to learn more. You can do the same thing to be the most effective leader you can possibly be.